With an interest in aviation and a large fortune, Howard Hughes founded the Hughes Aircraft Company (HAC) in 1934. HAC was a division of the Hughes Tool Company. The H-1 Racer of 1935 was the first aircraft that HAC built; Hughes flew the racer to set a number of records. Before the H-1 was completed, Hughes submitted a fighter version of the racer to the United States Army Air Corps (AAC) for a design competition (Specification X-603). Hughes had designated the aircraft XP-2, but the AAC turned down the design, selecting the fighter version of the Wedell-Williams Model 45 racer (as the XP-34) instead. The Hughes D-2 under construction at the Hughes Airport in Culver City, California. 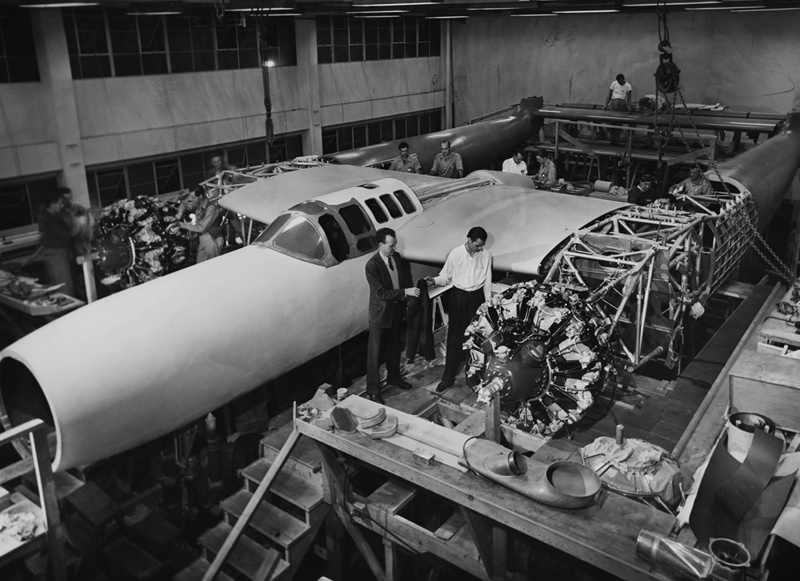 Hughes can be seen looking over the engine installation as he hands his jacket to Glenn Odekirk, Hughes’ long-time mechanic, engineer, and assistant. Note the aircraft’s airframe and smooth Duramold skin. The large housing on the bench in front of the engine appears to be an exhaust manifold to expel gases from the turbosupercharger and its waste gate. The next HAC aircraft Hughes envisioned was a twin-engine fighter. HAC had entered discussions regarding the aircraft with the AAC in 1936. In 1937, HAC submitted its proposal to the AAC for a twin-engine interceptor design competition (Specification X-608). The specifics and configuration of HAC’s aircraft are not available, but Hughes later contended that Lockheed had copied the basics of his design and used it for their proposal. 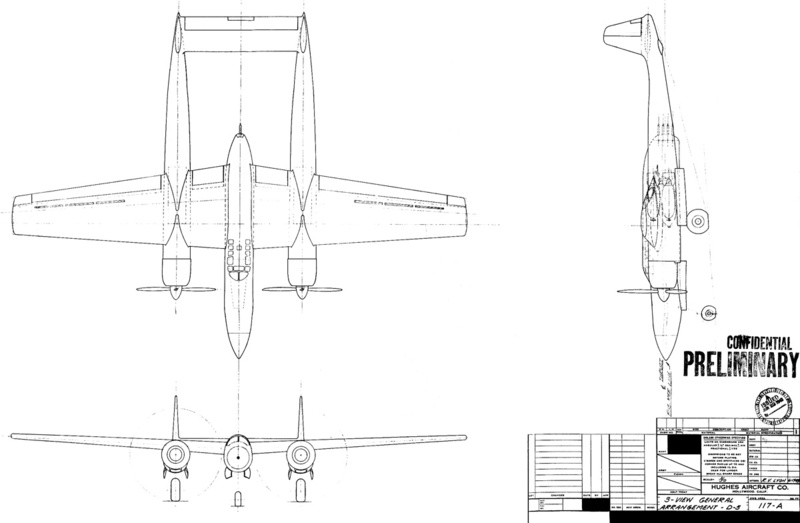 Lockheed’s proposal won the competition and was ultimately produced as the P-38 Lightning. In July 1938, Hughes and crew established a new record for an around the world flight in a modified Lockheed 14 Super Electra. The flight took 91 hours, 14 minutes, and 10 seconds. Hughes knew that a specially designed aircraft could be used to establish an even better time. Hughes also knew that the US and various European nations were purchasing all manner of aircraft because of the unrest the German government was creating in Europe. Hughes directed HAC to design a new aircraft with performance so outstanding that the AAC would be unable to turn it down. This new aircraft was designated the D-2. The designations D-2A, DX-2, DX-2A, XD-2, and D-3 were also applied at various times. 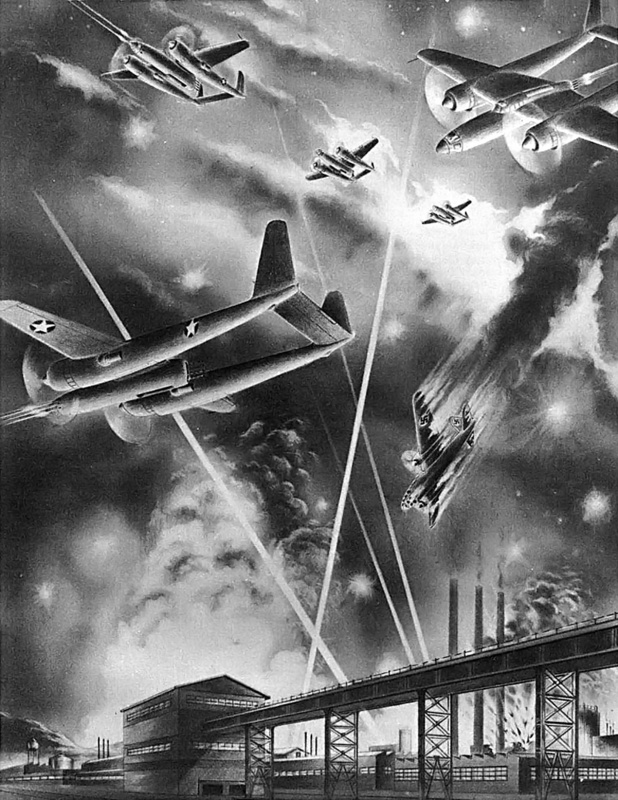 HAC artwork depicting numerous D-2s (A-37s) in combat over a German factory. Note the bomb bay in the rear of the fuselage. Stanley Bell began the initial D-2 design work in the summer of 1939. Some believe the D-2 was designed to set a new world record flight, and since such a flight could not be accomplished with the world at war, Hughes proposed a number of modifications and configurations to appeal to the AAC. However, others believe that Hughes intended the aircraft solely for AAC use. Virginius Clark, an HAC representative, visited the AAC in late 1939 to obtain a better understanding of what the AAC wanted in an interceptor-type aircraft. After his casual meetings, Clark suggested to Bell that a fast and maneuverable light bomber could act as a fighter. The belief was that such an aircraft would wreak havoc on enemy installations, forcing enemy aircraft to engage. Its maneuverability, speed, and powerful defensive armament would allow it to counter enemy fighters. Hughes had the D-2 built around this concept, not from an official request outlined by the AAC. In December 1939, HAC offered to provide the government a performance report of the D-2 once it was completed. The D-2 was described as a pursuit-type aircraft, and the report was priced at $50. While $50 would do absolutely nothing to recover the funds Hughes was spending on the D-2, a government contract associated with the aircraft would technically allow the release of war material (such as engines) to HAC. The AAC felt they had little to lose and were interested in the performance of the aircraft and its Duramold skin construction. Hughes was very focused on creating a streamlined aircraft, and had purchased the rights to using the Duramold Process. Duramold is resin-impregnated layers of wood molded to shape under pressure and heat; it replaced riveted aluminum aircraft skin. Duramold provided a surface free of joints and imperfections that was also quicker to construct. At the time, there were dire predictions of an aluminum shortage, and Duramold was seen as a possible substitution. The AAC issued a contract to HAC for the D-2 performance reports on 22 May 1940. By this time, the aircraft was described as a bomber capable of over 300 mph (483 km/h) and possessed a 4,000 lb (1,814 kg) bomb load. 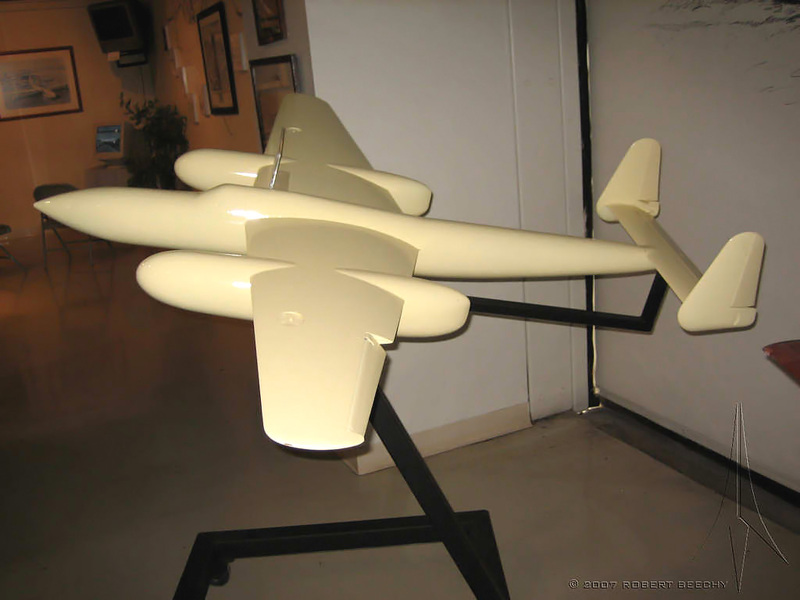 As the project progressed, wind tunnel models were used to evaluate the aircraft’s configuration. However, Hughes was so secretive that the models were not actually representative of the D-2’s configuration. Only the specific part being tested was accurate; the rest of the model’s configuration was inaccurate to prevent anyone from knowing the D-2’s true form. By March 1941, the D-2 had reverted back to a fighter role for bomber convoy protection. The D-2 was forecasted to have a 2,600 mile (4,284 km) range, a 450 mph (724 km/h) top speed, and would be armed with seven .50-cal machine guns. By July 1941, the D-2 and most of the HAC operation was moved from the airport in Burbank, California to a the new Hughes Airport, where a 9,500 ft (2,896 m) runway sat on 380 acres (1.54 sq km) of land in Culver City, California. In November 1941, the Army Air Force (AAF—the AAC was renamed on 20 June 1941) officially turned down the D-2 as a prospective fighter aircraft. The Duramold skin was seen as insufficient for a high performance aircraft, and the D-2 was not stressed to fighter aircraft load factors nor did it have any armor protection. Undeterred, Hughes moved forward with the construction of the aircraft while HAC engineers investigated ways to meet military specifications. The AAF’s position was reversed in early 1942 when they decided the D-2 prototype and its Duramold construction offered sufficient promise of aerodynamic improvement to warrant its procurement. Hughes had invested $3,000,000 in the D-2, but the AAF only wanted to spend $500,000. Hughes turned down the offer; he would wait until after the D-2 was flown, in the hope that its unparalleled performance would demand a higher price from the AAF. His jacket now hung on the engine, Hughes continues to look over its installation as Glenn Odekirk, Stanley Bell, and Kenneth Riley congregate on the other side. Perhaps they are discussing the proposed turbosupercharger installation. Note the construction of the D-2’s pressurized cockpit. The Hughes D-2 was a twin-boom aircraft with a sleek central nacelle. The D-2’s initial design featured a conventional, taildragger gear layout, but this was discarded in favor of a tricycle gear arrangement. The main wheels retracted back into the booms, while the nose gear rotated 90 degrees and retracted back into the central nacelle. Control of the ailerons, elevator, and rudder were all hydraulically boosted. The aircraft was constructed from both wood and metal. The central part of the D-2 was made up of a tubular frame to which formers and longerons were attached. The entire aircraft was covered with the Duramold plywood skin. The two person crew sat tandem in a pressurized cockpit. The crew consisted of a pilot and a navigator/bomber/gunner. Originally, two 42-cylinder, 2,350 hp (1,753 kW) Wright R-2160 Tornado engines were planned for the D-2. 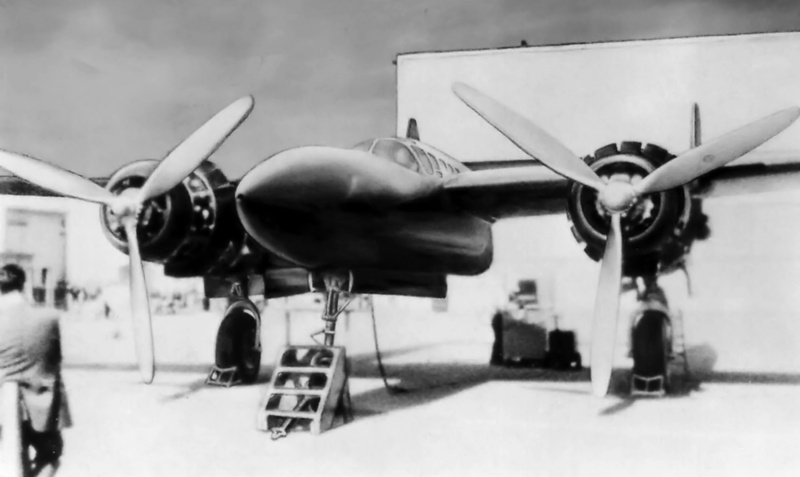 However, the AAF later promised these engines to the Lockheed XP-58 Chain Lightning program and provided HAC three (one as a spare) 2,000 hp (1,491 kW) Pratt & Whitney R-2800-49 engines. HAC was to develop its own twin-turbosupercharger installation for each engine, but neither this nor the cockpit pressurization equipment was ever fitted to the D-2. In late 1941, the D-2 design was unarmed and powered by R-2160 engines. The aircraft had a 60.5 ft (18.4 m) wingspan, was 34.25 ft (10.4 m) long, and had a gross weight of 26,400 lb (11,975 kg). The aircraft had a maximum speed of 451 (726 km/h) mph at 25,000 ft (7,620 m) and a cruise speed of 270 mph (435 km/h). The D-2’s climb rate was 3,620 fpm (18.4 m/s), and its service ceiling was 41,000 ft (12,497 m). 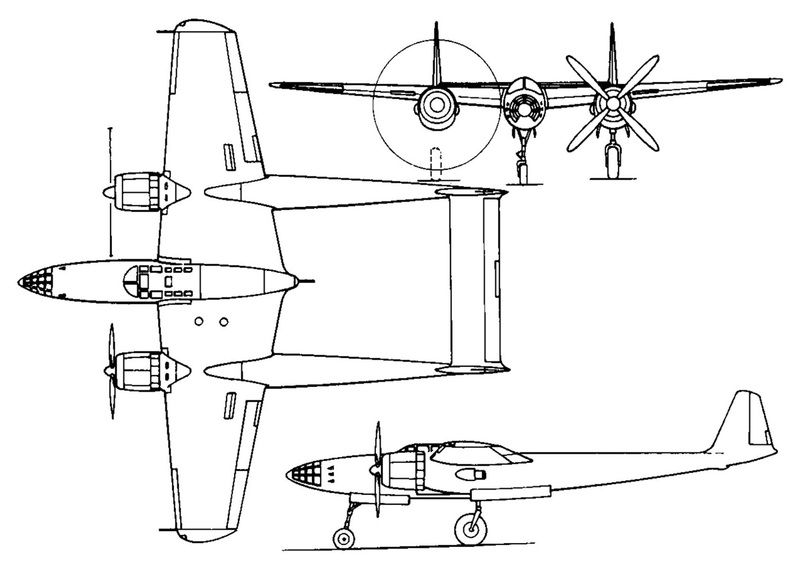 A three-view drawing of the proposed Hughes XA-37, with six machine guns in the nose and four in the rear fuselage. By mid-1943, the D-2 had been redesigned with R-2800 engines. The aircraft had a 60 ft (18.3 m) wingspan and was 57.8 ft (17.6 m) long. The D-2’s gross weight had increased to 31,672 lb (14,366 kg). Part of this increase was from the aircraft’s weapon load of 2,200 lb (998 kg) of bombs and ten .50-cal machine guns. Four of the guns were positioned one above the other in a turret of sorts at the rear of the central nacelle. The twin booms and horizontal stabilizer would severely restrict the rear machine guns’ field of fire. The six nose guns were hard-mounted, with three on each side of the fuselage. The R-2800-powered D-2 had a maximum speed of 433 mph (697 km/h) at 25,000 ft (7,620 m) and a cruising speed of 274 mph (441 km/h). The aircraft’s climb rate was 2,620 fpm (13.3 m/s), and the aircraft had a service celling of 36,000 ft (10,973 m). By June 1942, the AAF was interested in a high altitude reconnaissance aircraft and thought the D-2 might be a good fit. At the same time, the D-2’s intended role was defined as a fighter aircraft, and the AAF considered designating it the XP-73. In July 1942, the D-2 was envisioned in more of an attack role, and the designation XA-37 was recommended. However, the D-2 was never officially designated XP-73 or XA-37. The completed D-2 at what is believed to be Harper Dry Lake. The building behind the aircraft was the air conditioned hanger that would later burn with the D-2 inside. Note the aircraft’s sleek fuselage. 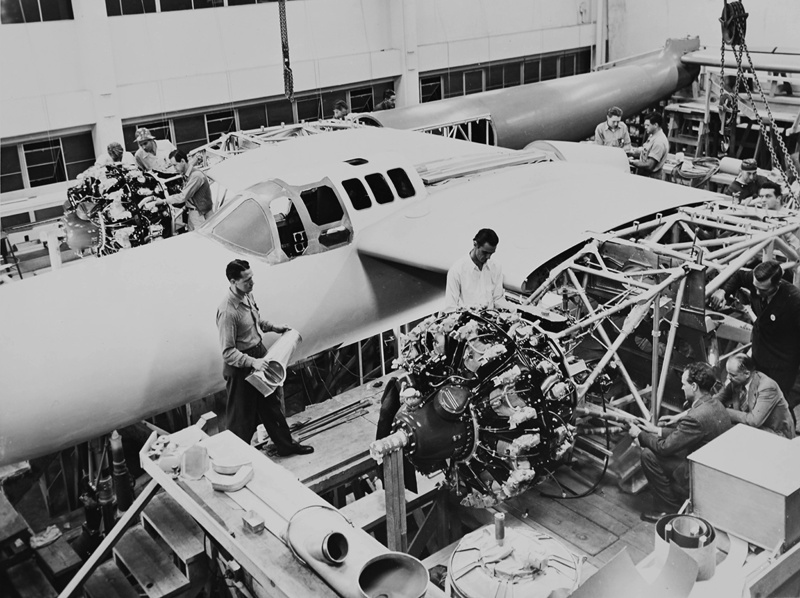 In early 1943, and still lacking a definite role, the nearly finished D-2 was moved for final assembly to a facility Hughes had constructed at the remote Harper Dry Lake near Barstow, California. Ground runs and numerous high-speed taxi tests accompanied by brief hops into the air revealed friction in the control system and that the controls were insufficient when the boost system was off. The first flight was delayed until the D-2 had been modified with larger ailerons to improve control. With Hughes in the cockpit, the D-2 flew for the first time on 20 June 1943. The first flight was 15 minutes long, and a flight of 35 minutes followed after some adjustments. Subsequent test flights demonstrated that the aileron control forces were high and the aircraft had a tendency to roll. In addition, some aileron control reversal was experienced. The D-2’s wing tips were extended, and its ailerons were further modified in an attempt to fix the issues. The D-2 accumulated at least nine hours of flight time, but the control issues persisted. The aircraft needed major modifications, including a new wing, before it would be an acceptable aircraft. The fuselage also needed modifications to enlarge its bomb bay. Incorporating these changes into the D-2’s design resulted in a new HAC designation: D-5. Side view of the D-2 at Harper Dry Lake. While the turbosuperchargers were never fitted, the engine’s exhaust can be seen just below the wing. Note the aircraft’s long nose and tailstrike bumper. Many in the AAF were still not interested in the D-2 or the D-5. Part of the problem was that Hughes acted erratically and was difficult to work with. They also felt HAC did not have the capacity to enter series aircraft production. In late August 1943, the AAF officially directed no further action be taken with the D-2 or D-5. However, Hughes had already taken steps to sufficiently impress those in power and secure a contract for the D-2/D-5. In early August 1943, Col. Elliot Roosevelt, President Franklin Roosevelt’s son, was in the Los Angeles area looking in on various aircraft manufacturers to find a reconnaissance aircraft. Col. Roosevelt, who had previously commanded a reconnaissance unit, was wined and dined by Hughes and taken to Harper Dry Lake for a personal tour of the D-2. At the time, the aircraft was undergoing modification to become the D-5 and was not available for flight, but Col. Roosevelt was sufficiently impressed. This led the AAF to issue a letter of intent on 6 October 1943 for the purchase of 100 D-5 aircraft. An official contract was issued in January 1944, and the D-5 was designated F-11 by the AAF. A Hughes D-5 drawing dated 17 June 1943. The aircraft is very similar to the D-2, but with a new wing. The D-5 was of Duramold construction and powered by R-2800 engines. Its specifications included a wingspan of 92 ft (28.0 m), a length of 58 ft (17.7 m), a top speed of 488 mph (785 km/h) at 30,000 ft (9,144 m), a service ceiling of 37,000 ft (11,278 m), and a gross weight of 36,400 lb (16,511 kg). Note the bombs in the internal bay and rear guns. In November 1944, an unexplained fire broke out in the Harper Dry Lake hanger that housed the D-2. Both the plane and the hanger were completely destroyed. This mattered little to Hughes; he had moved on to building the XF-11 prototypes, which had changed considerably from the original D-5 design. Hughes claimed that he should be reimbursed for the $3.65 million he had spent on the D-2. He felt the D-2 served as the prototype for the F-11—although they only shared the same basic configuration. The AAF countered that the aircraft were significantly different. Ultimately, Hughes and the AAF came to an agreement in which HAC recovered $1,906,826.13 for the cost of the D-2. The F-11 contract was later cut to just two prototypes. Hughes was nearly killed in the crash of the first XF-11 prototype during its first flight on 7 July 1946. The D-2’s ultimate design configuration and purpose seemed to change at the whim of Hughes. The fact that the military applied so many designations and roles indicates that they struggled to find a niche for the aircraft. Since it was designed to Hughes’ own specifications and not to the needs and wants of the military, the D-2 was of little use to the AAF unless it underwent extensive redesign. Rather than being the high-performance aircraft Hughes had envisioned, the D-2 exhibited unsuitable control issues. Some believe Hughes had the hangar and the D-2 burned to rid himself of the failed aircraft and avoid having to admit it was a failure. The Hughes XF-11 was of all-metal construction and much larger than the D-2 and the D-5 design. The aircraft was powered by Pratt & Whitney R-4360 engines, had a wingspan of 101 ft 4 in (30.9 m), a length of 65 ft 5 in (19.9 m), a top speed of 450 mph (725 km/h) at 33,000 ft (10,058 m), a service ceiling of 42,000 ft (12,802 m), and a gross weight of 58,315 lb (26,451 kg). 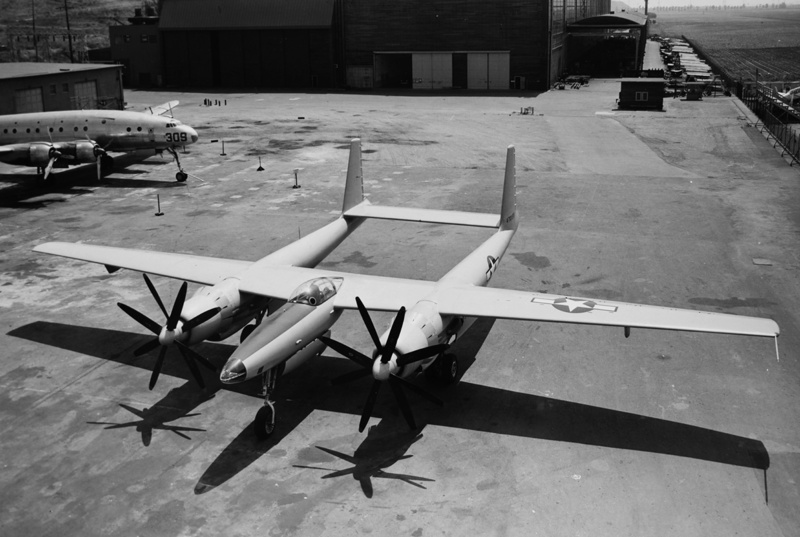 The first XF-11 prototype can be identified by its contra-rotating propellers. It was a reversal of the right rear propeller that caused Hughes to crash the aircraft. However, if Hughes had adhered to the AAF’s test flight guidelines, the accident would not have occurred. This entry was posted in Aircraft, World War II on 23 November 2015 by William Pearce. I lost track of how many different designations the D-2 was given during its lifetime! Very interesting article about one of the real mystery planes that has only been discussed in recent decades. I had not seen the pictures of the finished product before. With reference to the contra prop problems with the XF-11 A number of prototypes used contra props in this period. The B-35, already range deficient, suffered a performance loss when they had to abandon the contra props, which were government supplied items. I have never seen a history of contra prop development in this period, and it would be of some interest. The pattern of reflections presented to the pilot of a single engine plane could be very disturbing.